Mona El Shemy. Photo: Chris Sant Fournier. Right: Rasha Omran. Photo: Matthew Mirabelli. Atrocities worse than those carried out by the Gaddafi regime are going on in Syria, and yet “the international silence is deafening,” according to a Syrian poet and journalist. “I had many opportunities to leave Syria, but I don’t want to. In these revolutionary times, there is a big chance that Islamist groups are formed. I want to stay on to ensure there are secular intellectuals present for the revolution too,” Rasha Omran tells The Sunday Times. Ms Omran, and Egyptian poet Mona El Shemy were recently in Malta for the Mediterranean Literature Festival, organised by Iniż-jamed and Literature Across Frontiers, which this year was centred around the Arab Spring of Dignity. She says the riots in Egypt and Tunisia were the tipping point for unrest which had been boiling for the past five years. “The middle class has disappeared, leaving us with a very small, rich elite who treat the rest of Syria as their farm,” she says, pointing to a UN report which put 42 per cent of the population below the poverty line. She says that Damascus appears to be quiet most of the time because of a very strong police presence, and revolutionaries have mastered the art of “flash demonstrations”, which were quick enough to evade police action. “The regime realises that once the capital falls, the rest will follow.” However, she does not envisage the regime collapsing in the same way as Tunisia and Egypt. “It won’t happen soon. The regime will defend itself till the last drop of blood. The president is more criminal than Gaddafi; what happened in Syria is unimaginable,” she says. “More than 100,000 people were arrested in the past five months. The schools, stadiums and cinemas have been turned into jails, and what happens in there is unbelievable,” Ms Omran says, referring to an Amnesty International report which claimed 83 people died following torture. She says the internet, calls and messages are closely monitored by the authorities. “They think Facebook is the reason behind the revolution,” Ms Omran laughs. The poet is not averse to using the social network for political reform, and she is aware of the risks she faces, with her daughter already having been arrested for being part of a demonstration. “Of course I (have) fear. It’s dangerous, and I could be arrested any minute,” she says. Yet, both writers agree there is still a long way to go for the revolutions in Syria and Egypt to bear fruit. Ms El Shemy, an Egyptian poet who works as a history teacher, says the revolution only started now. “Mubarak has gone, but now the task is to make the transition from military to civil society,” Ms El Shemy, 42, says. The military is over-arching in Egypt, with considerable stakes in industry, and the poet remarks that it has made mistakes of its own. Egypt long had problems of its own, such as rampant corruption, and stirrings were already being felt. “We had freedom of the press, but I was not interested in a free press when we had a police state and dismal education and healthcare. Children had a dark future, unemployment was rife, everything called for a revolution,” Ms El Shemy says. But there is still a long way to go for democracy to happen, as there are entire villages and regions through which the revolution is still to pass. 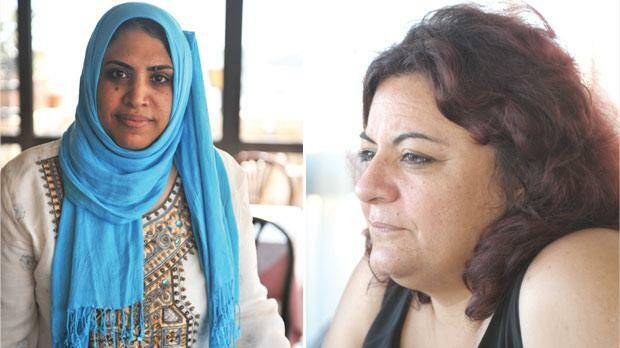 “The revolution still hasn’t happened in people’s minds,” Ms el-Shemy says.